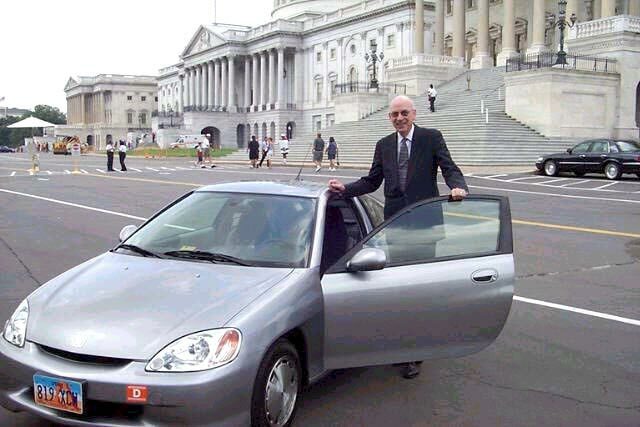 WASHINGTON, D.C. -- Senator Bob Bennett (R-Utah), chairman of the Senate High-Tech Task Force, is the proud new owner of a high-tech car -- a 2000 Honda Insight, the first gasoline-electric hybrid vehicle sold in the United States. "When it was time to replace my seven-year-old car, the new hybrid really caught my attention," Bennett said. "Now, not only do I have a new car, I have a new high-tech marvel." "I do my best to pay attention to what's new in the high-tech world and while the advances are staggering to keep up with, they're changing our lives every day in very exciting ways," Bennett added. Bennett's interest in the Insight came in part through his immersion in technology issues which began with his chairmanship of the Senate Y2K Committee and more recently as chairman of the Senate Republican High-Tech Task Force. Bennett also hosts an annual technology conference in Utah and regularly uses many high-tech devices and online services. For his five-mile commute to the Capitol, and the time he and his wife Joyce spend in and around Washington, D.C. and northern Virginia where they live, Bennett looks forward to the ease of driving and parking a small car in a busy city. The gas-electric car achieves an unprecedented 61-miles-per-gallon (mpg) in city driving, 70-mpg on the highway. It can travel 600-700 miles on a single tank and has received the EPA's highest fuel economy rating for a gasoline-powered car. Car Magazine calls the Insight a "statement by Honda of its technological muscle." "I'll fill the tank every two months, whether it needs it or not," the senator said. In addition to the technological advantages, Bennett is impressed with the hybrid's ultra-low emissions. The hybrid vehicle combines an internal combustion engine and an electric motor for improved fuel efficiency. It takes advantage of the best traits of each power system -- the clean nature of electricity, and the performance, unlimited range, and convenient refueling infrastructure of a gasoline-powered engine.